Publish date: 5. October 2018. The WHO Regional Office for Europe has published results of a new study of the level of pyhsical activity in EU member countries. Data obtained were published in co-operation with the European Commission in the form of country factsheets that show recent epidemiological data on the physical activity of children, adolescents, and adults as well as data on policies and activities in the field of health enhancing physical activity (HEPA). 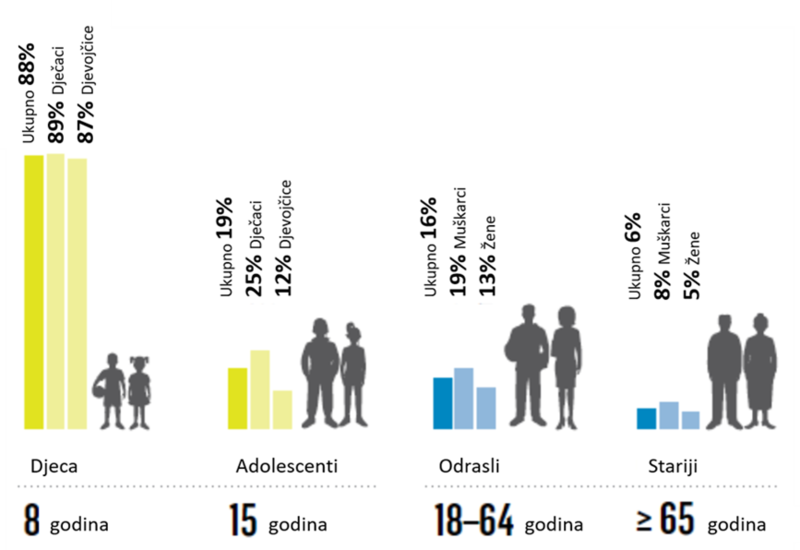 Croatia was among the countries surveyed and its activities within the National Programme Living Healthy such as Polygons for Physical Activity of School Children, Walking Towards Health, Volunteers in Park, and Health-friendly Company have been included as examples of good practice in the field of health enhancing physical activity. The role of counselling centres for healthy nutrition and physical activity of the Croatian Institute of Public Health and thirteen regional public health institutes was also emphasized. The factsheet shows data on the prevalence of satisfactory physical activity level in children, adolescents, adults and eldferly. The level was estimated on the basis of WHO recommendations, i.e. a minimum of 150 min of moderate-intensity physical activity per week for adults and 60 min a day for children and adolescents. Data on eight-year olds were obtained from the European Childhood Obesity Surveillance Initiative from 2015/2016, data on adolescents from Health Behaviour in School-aged Children (HBSC) study from 2013/2014, and those for adults and older persons were obtained from the European Health Interview Survey (EHIS) from 2014/2015. Croatia – Physical activity factsheet 2018 can be found at the WHO Regional Office for Europe web page.